"Now Hiring: The Growth of America's Clean Energy & Sustainability Jobs" [PDF] discusses the current status and key trends in renewable energy and energy efficiency, and summarizes some of the major advances in other sectors such as local/state government, transportation and the private sector. Throughout this report, sustainability professionals from the EDF Climate Corps network are profiled to help highlight the diverse skills and expertise of those working in sustainability jobs. 1. Sustainability jobs represent a large and growing portion of the U.S. workforce across multiple sectors. These jobs span energy efficiency and renewable energy, as well as in waste reduction, natural resources conservation and environmental education. Sustainability now collectively represents an estimated 4-4.5 million jobs in the U.S., up from 3.4 million in 2011. 2. Due to the on-site nature of many renewable and energy efficiency jobs, they cannot be outsourced, and can pay above average wages. Many jobs in the solar and energy efficiency space are in installation, maintenance and construction, making these jobs inherently local and contributing to the growth of local economies. 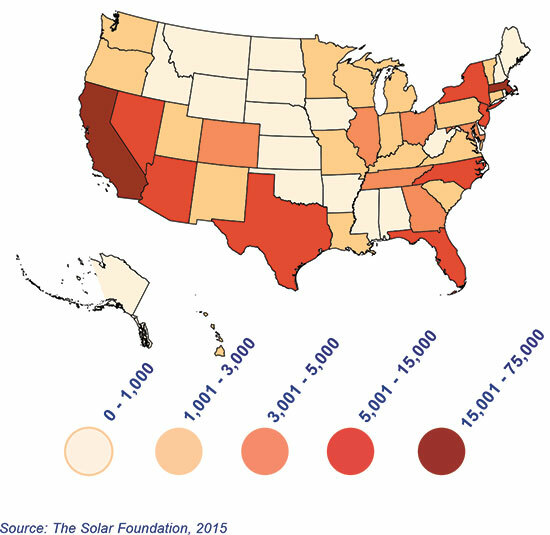 Average wages for energy efficiency jobs are almost $5,000 above the national median, and wages for solar workers are above the national median of $17.04 per hour. 3. 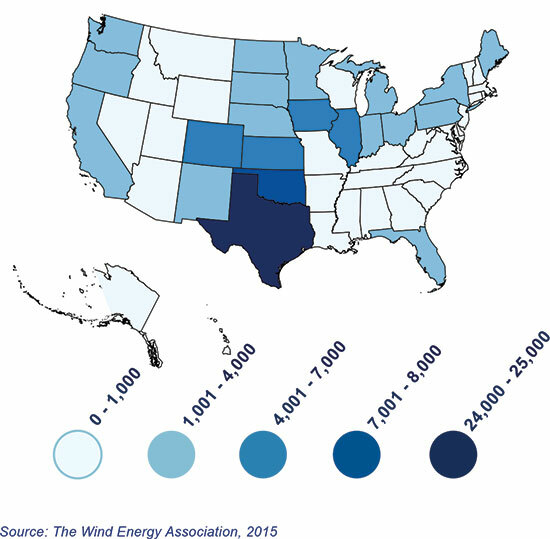 Clean energy and sustainability jobs are present in every state in America. It’s not just one region that benefits – all states have some type of clean energy or sustainability job opportunity – employing workers across the country. The renewable energy sector has seen rapid growth, driven largely by significant reductions in manufacturing and installation costs. 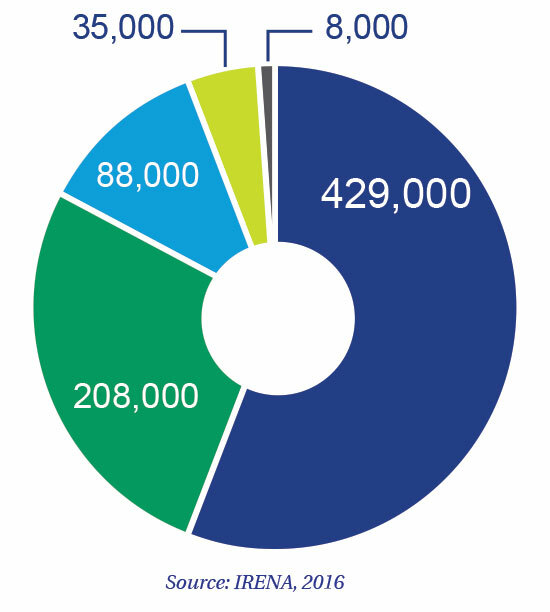 In 2015, renewable energy jobs in the U.S. reached 769,000, the result of a compound annual growth rate (CAGR) of nearly 6% since 2012. 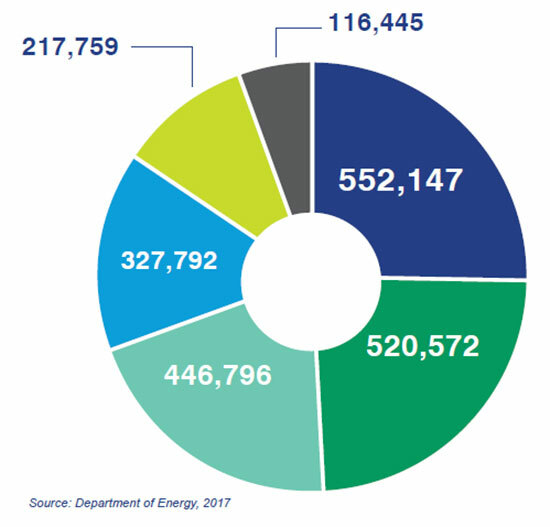 Job creation in this sector has outstripped the fossil fuel industry: for example, jobs in fossil fuel extraction and support services slumped, with a -4.25% CAGR over the same period. Solar and wind jobs have grown at rates of about 20% annually in recent years and are each creating jobs at a rate 12 times faster than that of the rest of the U.S. economy. The energy efficiency sector has seen substantial growth due in part to rising investments from building developers and owners that have been fueled by state and local building efficiency policies and incentives. There are approximately 2.2 million energy efficiency workers nationwide, the majority of which are in small businesses working on the construction and installation of energy efficient systems. Studies have also shown that energy efficiency investments create more jobs than those in fossil fuel industries: estimated at approximately 8 jobs (direct and indirect) per $1M invested compared to about 3 jobs in fossil fuels. Advancements in vehicle manufacturing and rising consumer demand have helped accelerate the automotive industry’s transition toward alternative fuel vehicles in recent years. Clean vehicles in 2016 employed 48% more workers than in 2015. Hybrid vehicles have experienced especially rapid growth and now represent more than 70% of these jobs. Continued progress in this sector is expected, fueled by rising adoption, expanded charging infrastructure, as well as state and local government incentives and regulations. As of 2016, the advanced vehicle sector employed over 174,000 workers across the nation. Government agencies not only develop policies and programs that accelerate the growth of sustainability job markets; these agencies also directly employ a significant number of sustainability-focused staff. There is reason to believe that the increased focus on energy, climate, clean transport, and other sustainability issues is further growing the public sector’s green workforce requirements. The public sector employs nearly 890,000 sustainability focused staff at the local, state and federal level. Consumers are increasingly demanding more sustainable goods and services and corporate commitments to environmental responsibility. There is strong evidence that companies are increasing investments in sustainability. For example, a 2016 GreenBiz survey found that 3/4 of firms surveyed had dedicated sustainability budgets and 40% had grown these over the previous two years. As companies continue to imbed sustainability throughout their organizations, job opportunities are likely to grow. A 2016 GreenBiz survey found that 46% of large firms have hired sustainability staff in the last two years. Increasing investments in clean energy and sustainability translate to tangible economic impacts throughout the U.S. economy. Research shows that sustainability investments and energy savings create real economic upside: creating more jobs per dollar invested, keeping more energy spending in the domestic economy, and creating high-paying job opportunities that improve lives and stimulate local economies. Policy makers at the local, state, and federal level should recognize the positive economic impacts of this new job class and strongly support the policies and programs that encourage growth and investment in renewable energy, energy efficiency, green transportation, and more.